Finschhafen (147.85E 6.60S) is a village on the tip of the Huon Peninsula of New Guinea. There is a small but undeveloped anchorage just to the north. There is also a larger but less well protected roadstead to the southwest at Hanisch Harbor (147.60E 6.73S). The town was occupied by the Japanese on 11 March 1942. Air attacks failed to drive the Japanese out or prevent them from completing an airstrip north of the town. Following the collapse of Japanese resistance at Lae on 15 September 1943, MacArthur ordered that Finschhafen be seized as quickly as possible. On 17 September he set the invasion date for just five days later. 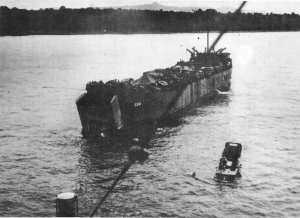 Barbey loaded supplies at Buna and assembled the invasion force off Lae on 21 September, where 20 Australian Brigade embarked. The force was sighted by a force of six Ki-21 "Sallys" escorted by a number of A6M "Zeros", but their bombs fell wild and several of the aircraft were downed by Allied fighters. Barbey wished to land in the dark to avoid Japanese air cover; the Australians agreed to a landing just before dawn. Confusion reigned, showing that Barbey's force still had much to learn about night landings. However, General Yamagata had redeployed 3000 men from his 21 Independent Mixed Brigade to the south at Hanisch Harbor, facing Lae, leaving only 1000 in Finschhafen itself and a few hundred in the vicinity of the landing beaches north of the village. Yamagata was caught by surprise, and a strike of 6 G4M "Bettys" escorted by 35 "Zeros" was beaten off by fighters and antiaircraft after damaging a single ship. By 2 October Finschhafen was in Australian hands. Yamagata retreated with his force to 3240' (988 meter) Satelberg Mountain, which dominated the Huon Peninsula and the straits to the east, and planned a counterattack. His operational plan fell into Allied hands, 9 Division headquarters with 24 Brigade was sent in on 11 October, and the Japanese counterattack was beaten off in the early hours of 16 October 1943. Yamagata was joined by 20 Division the next day and staged a second counterattack. The Australians were reinforced by tanks of 26 Brigade on 20 October and beat back the counterattack. Satelberg Mountain finally fell on 8 December. Following the capture of Finschhafen, the Allies improved the runway north of town and built a second airfield at Schneider Harbor south of the town.